I'm always on the search for a low fat cookie recipe. My boys love cookies and it really is hard for them to stop at one. I came across this recipe on Skinnytaste. I liked that they were oatmeal cookies and I find that if I put chocolate chips in anything, the boys will gobble them up! Preheat oven to 350°F. Line 2 baking sheets with parchment paper or silpat. In a medium bowl, whisk together flour, baking powder, baking soda, salt and cinnamon. In the bowl of an electric mixer fitted with the paddle attachment, cream together butter and sugars on medium speed. Beat in the egg. Add the applesauce and vanilla extract and mix. Using a spoon, mix in the flour mixture and oats until just combined. Gently stir in the chocolate chips. Drop the batter by tablespoonfuls onto the prepared baking sheets. Flatten slightly. Bake 10-12 minutes or until light brown at the edges. Let cool on baking sheet for 3-4 minutes and then transfer to a cooling rack. Store in an air-tight container. These are awesome! Would love to try these out once I get back inshAllah. Btw, do these turn out soft or crunchy? 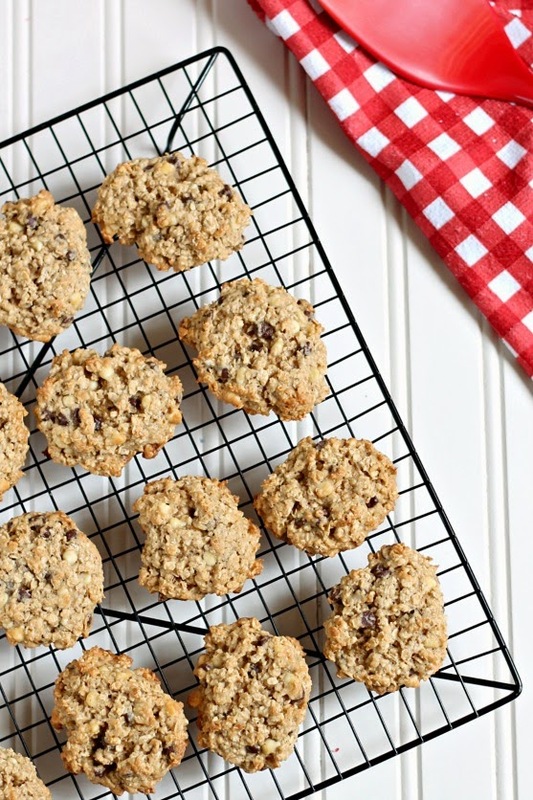 You can't go wrong with chocolate and oatmeal cookies - they are a classic!